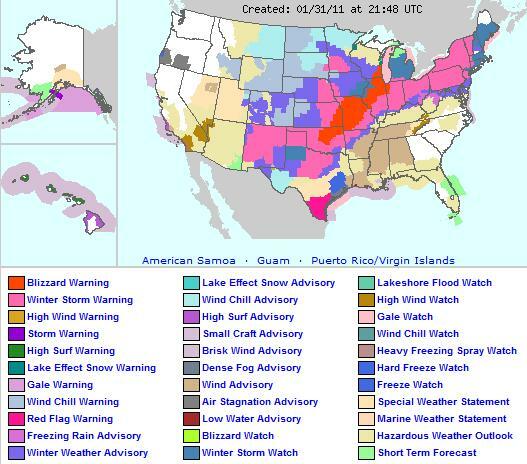 Nearly half of the U.S. and about 1/3 of the nation’s population is bracing for a major winter storm, to take place today through Wednesday or so. 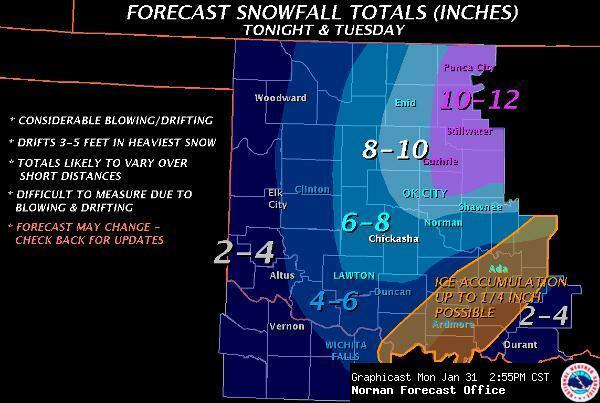 Since there’s a lot that could be said, and I don’t have a lot of time for an in-depth post, I’ll just post some graphics from the National Weather Service. 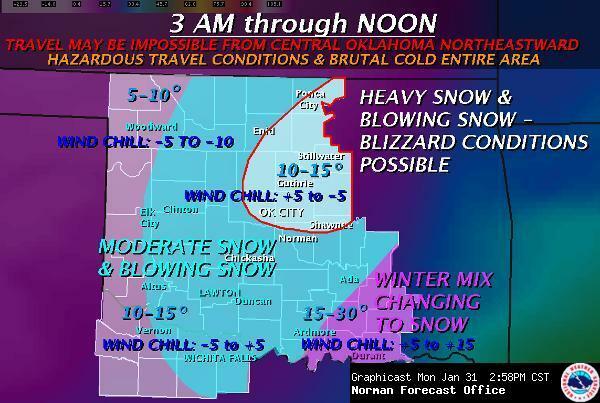 I might add that to my knowledge, this is the first blizzard warning that I have ever been under (I missed the Christmas Eve 2009 blizzard, which was the first blizzard in central Oklahoma in modern history and dumped 13.5 inches of snow on Oklahoma City, with several-foot drifts). 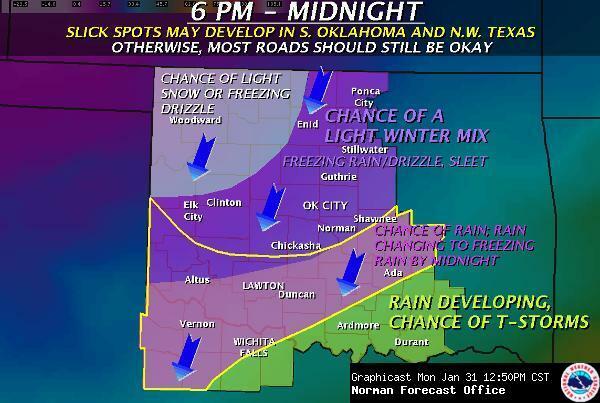 Currently, here in Norman, it’s mostly cloudy, dry, 45 °F, with a north wind of about 15 mph. It’s hard to believe that within 24 hours we could have several inches of snow on the ground! 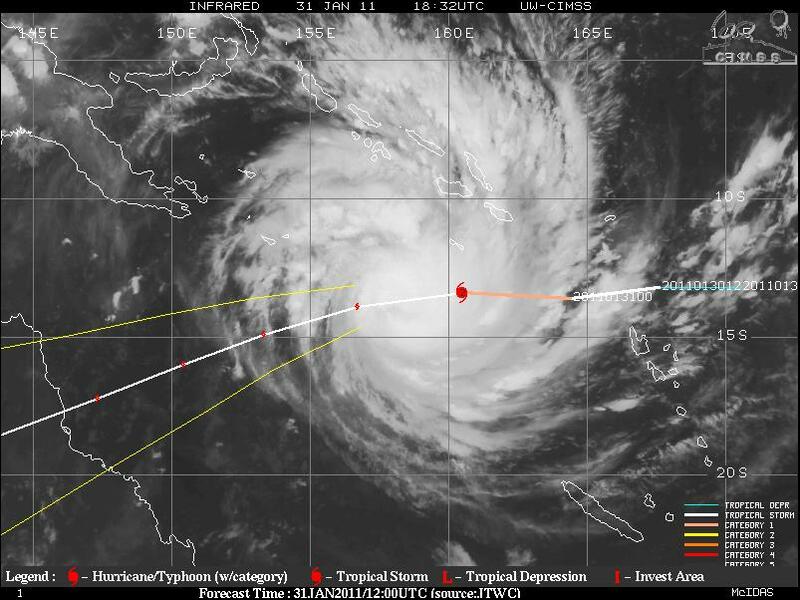 Yesterday I posted forecasts for a new tropical cyclone, Yasi, that had formed near Vanuatu. Yasi has strengthened considerably over the past 12 or so hours, and is currently a Category 3 severe tropical cyclone on the Australian scale (Category 2 on the Saffir-Simpson scale), with a maximum 10-minute wind speed of 98 mph (156 kph) and a minimum pressure of 960 mb. Maximum wind gusts are estimated to be near 138 mph (221 kph). Yasi is moving westward at 25 mph (40 kph). Yasi’s track has shifted a bit further north, so the tropical cyclone is now forecast to make landfall Wednesday night / Thursday morning (Australian time) near Cairns/Innisfail, Queensland. Yasi is over some pretty warm waters and a low shear environment (see this blog post for info on how tropical cyclones form and strengthen), so more strengthening is expected. The Australian Bureau of Meteorology is calling for Yasi to peak in strength late Wednesday afternoon (Australian time) as a Category 4 cyclone (on both the Australian and the Saffir-Simpson scales) with maximum sustained winds of 121 mph (193 kph) and a minimum central pressure of 939 mb. The cyclone may weaken just a bit before making landfall, but it is likely that it will make landfall as a Category 4 storm. To keep up-to-date with the Bureau of Meteorology’s latest forecast tracks and tropical cyclone advice, see the tropical cyclone section of their webpage. Another good website with tropical cyclone tracks and information, that I have yet to mention, is Weather Underground. Today’s post in the weather education series is on moisture in the atmosphere (e.g., phases, measurements, etc. ), one of the seven elements of weather (temperature, pressure, wind, moisture, clouds, precipitation, and visibility). 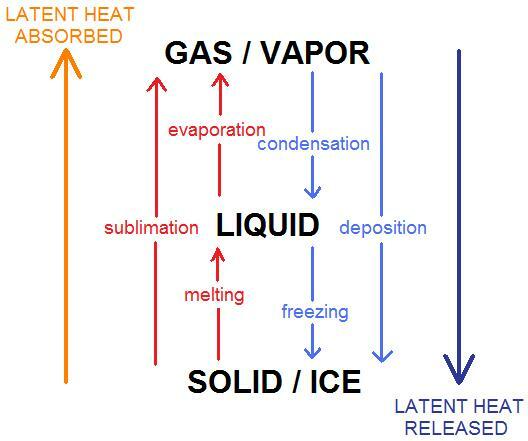 Water comes in three phases: gas (water vapor), liquid, and solid (ice). The following figure shows the names for the different phase changes. Note that when water goes to a higher energy state (read: the molecules are moving faster so the temperature is higher), latent heat energy is absorbed, cooling the atmosphere. Think about it: when you want to melt some ice, you have to apply some heat…but where does the heat go? The heat is absorbed by the ice, allowing it to melt and then leaving the environment cooler than it was before. Also, think about how you feel cooler when you get out of a pool: water droplets on your skin evaporate, drawing heat from your body and thus leaving you feeling cooler. The reverse is true as well; when water goes to a lower energy state (e.g., ice to liquid or vapor), latent heat energy is released, warming the atmosphere. Atmospheric moisture can be measured in a variety of ways, the most common being dewpoint temperature and relative humidity. Dewpoint temperature is an absolute measure of moisture, and the units are the same as those of air temperature (°F, °C, K). The dewpoint is basically the temperature at which the air would reach saturation, if the temperature were to drop. Thus, the higher the dewpoint, the higher the moisture. Dewpoints above 60 °F are indicative of humid conditions, while dewpoints below 40 °F are generally indicative of dry conditions. Relative humidity is given as a percent, and as it is a relative measure of moisture, a higher relative humidity does NOT necessarily mean there is a high amount of moisture in the air…it ONLY means that the air is closer to saturation. Think about it: if the air temperature is 30 °F, the dewpoint temperature must be less than or equal to 30 °F (remember, the dewpoint temperature can never exceed the air temperature). So even if the relative humidity is 90%, you still have dry air…it just means you might be close to saturation (maybe it’s foggy or snowing). Now, let’s say the dewpoint temperature stays the same for 24 hours…what happens to the relative humidity? As the air temperature goes up, the relative humidity goes down (see figure, above)…as the air temperature rises during the day, the difference between the air temperature and the dewpoint becomes greater (thus the relative humidity goes down)…and as the air temperature falls at night, the difference between the air temperature and the dewpoint becomes less (thus the relative humidity goes up, and you may get dew on the grass). Come back next Monday as we talk about clouds, the next element of weather. As if Queensland hasn’t already seen enough rain and flooding to last a lifetime, a new tropical cyclone is forming in the southeast Pacific, and models show it strengthening to possibly a Category 3 (Australian) cyclone (probably only Cat. 1 on the Saffir-Simpson scale) just before making landfall somewhere near or south of Townsville, Queensland on Thursday. This tropical cyclone, Yasi (on the Fiji names list), may bring 70+ mph (110+ kph) winds and heavy rain when it makes landfall. The GFS model is currently predicting a minimum pressure of 976 mb, while the ECMWF is predicting a minimum pressure of 972 mb, with a slightly faster track. Waters off the eastern coast of Queensland are warmer-than-normal, aiding in the strengthening of Yasi just before landfall. Here’s another link, from NCDC, showing sea-surface temperature anomalies across the entire globe over the past 5 weeks. 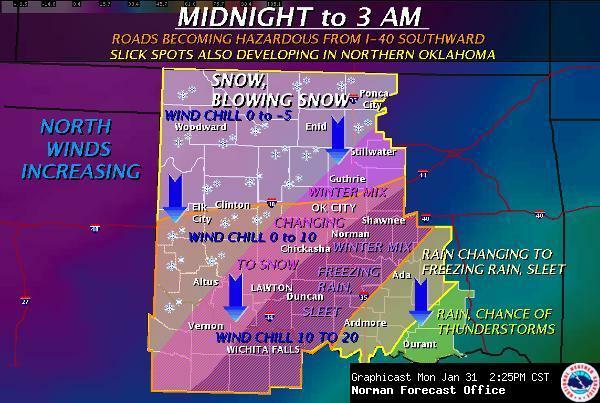 For quite some time now the models have been hinting at the possibility for a decent amount of snow and possibly ice for Oklahoma this week. 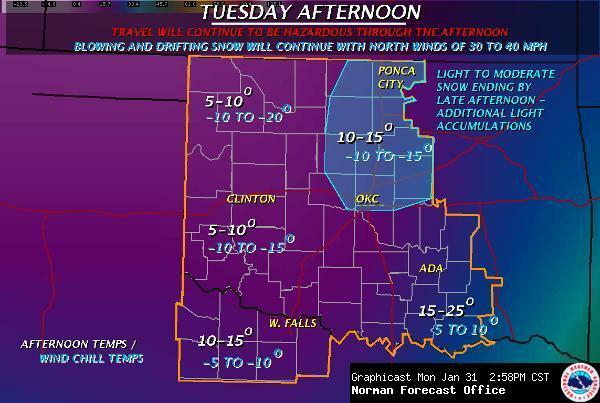 The models have come to some sort of agreement lately and it’s looking like parts of central to northern Oklahoma could see several inches of snow from Monday night into Tuesday. There may be some sleet or even freezing rain Monday night as well, but the GFS and the NAM aren’t showing much of a warm layer, if any. A strong, arctic high (could be as high as 1048 mb or so) will edge down into the Northern Plains, bringing frigid air along with it. 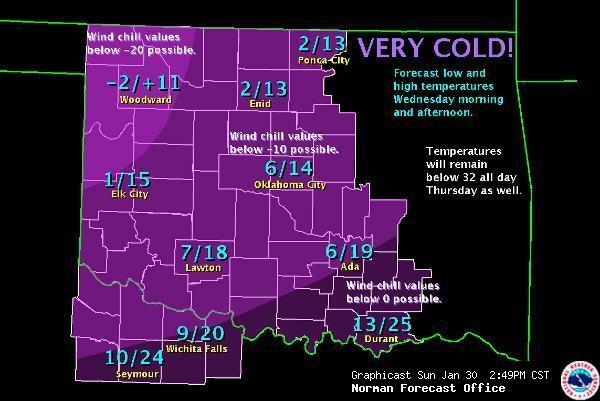 The National Weather Service in Norman (Oklahoma) is calling for a low of 7 °F in Norman Tuesday night. We could certainly use some precipitation…it’s been so dry in the Southern Plains, and numerous fires have broken out in the last couple of days. These last two days have been nice in terms of temperature, though; yesterday Norman reached 79 °F and today 76 °F! 🙂 I still haven’t turned my heat on…I haven’t had the heat on since March, if not February of 2010. My apartment stays insulated pretty well and so far this winter it hasn’t stayed cold for longer than a couple of days. Here’s the 5-day precipitation (liquid-water equivalent) forecast from the Hydrometeorological Prediction Center…looks like it could be wet for much of the U.S. this week!